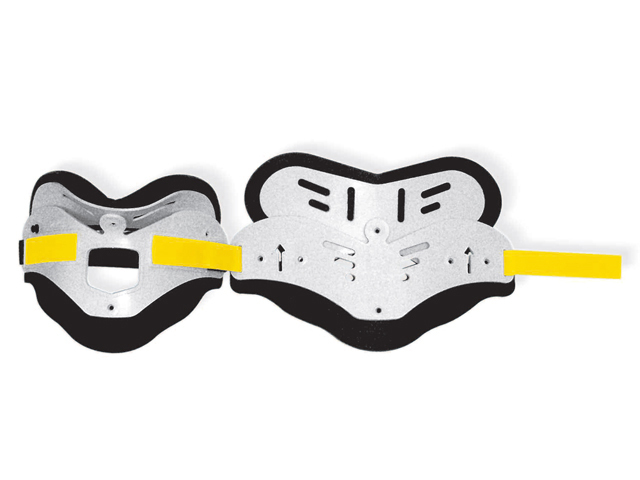 Nec Loc is the most used rigid two-piece cervical collar for extrication in the world. It was developed by professionals of EMS and by researchers at prestigious bio-engineering universities in the USA, with the aim to produce a fast and safe immobilization of the cervical rachis. With respect to one-piece collars, Nec Loc assures a better control of the axial rotation movements and lateral flexion. It is easy and rapid to apply, even in confined spaces, thanks to an adjustable closure in self-adherent strips, which enables precise aligning. The fundamental structure is realized in low density polyethylene, it is flexible to improve application and rigid to optimize immobilization. The comfort of the patient is assured with the use of an internal padding of expansive, high density, closed-cell Plastizote. It has a front opening to facilitate access to the tracheotomy. To enable a rapid identification of the Nec Loc required, each size is identifiable by a different colour. The low density polyethylene assures easy cleaning. In fact, any residual blood or grease can be efficiently and easily removed. To reduce the thickness and the elements for assembly, a novel interfacing has been used for the realization of the joints of the collar. A fast pressure mechanism returns Nec Loc to a flat position that allows for storage in limited space.